The future is brighter for rare native kakariki after a University-led project to move 31 to a predator-free home on Motuihe Island in the Hauraki Gulf. The historic move of the red-crowned parakeets should encourage the birds to thrive throughout the region, and allow more people to see them as they travel between islands and the mainland. More than 200 conservationists witnessed the release on Saturday of kakariki (Cyanoramphus novaezelandiae) on Motuihe, a 179-hectare island where the birds once flourished before the arrival of rats and other introduced species wiped them out. 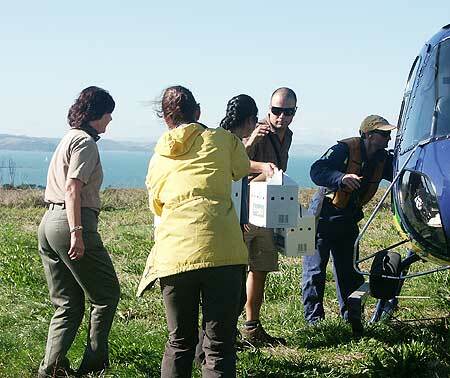 The birds had been flown in by helicopter on May 17 from Little Barrier Island, then carried in cardboard boxes to a glade of pohutukawa trees where they were ceremoniously released. The bright green parakeets with distinctive red foreheads disappeared in a flash into the forest now being restored with native trees and other native birds. It was the first of three translocations of wild kakariki organised by Massey conservation doctoral researcher Luis Ortiz-Catedral, in collaboration with the Department of Conservation and volunteers from the Motuihe Trust. More kakariki will be taken from Little Barrier Island – a wildlife reserve in the Hauraki Gulf where there are several thousand kakariki – to neighbouring Rakino Island as well as a mainland site at Tawharanui Regional Park north of Auckland. More than 100 kakariki will have been dispersed throughout the Hauraki Gulf region by the time the project is completed at the end of next summer. 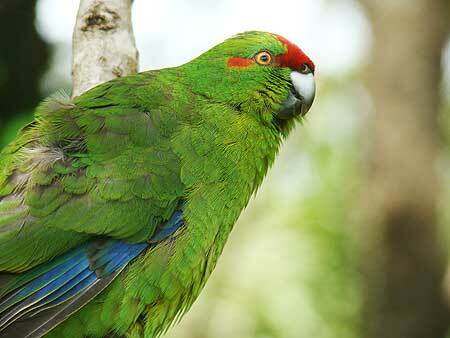 There are now 31 kakariki – 16 males and 15 females - on Motuihe Island, with plans to transfer another 20 later on. The timing of the translocations is to avoid disrupting the birds during their October to February breeding season, says Mr Ortiz-Catedral. The kakariki were caught in large nets covering forest areas, then put into a special aviary before being transferred by helicopter. Mr Ortiz-Catedral said getting a wild bird into a box for translocation was just the beginning of the responsibility of conservationists. After that, he and several volunteers will carefully monitor the newcomers to the island to observe their nesting, mating and feeding patterns. Using radio transmitters, they will know where the birds settle, and if they fly to neighbouring islands. The data gathered is part of Mr Ortiz-Catedral’s doctoral thesis comparing translocations of captive and wild kakariki. He is also studying rare, endangered orange-fronted kakariki which were bred in captivity in the South Island and transferred to Maud Island in the Marlborough Sounds. Mr Ortiz-Catedral says the study is significant as he has learned much about the birds’ behaviour in the course of the project – the first translocation of red-crowned kakariki within the Hauraki Gulf in 30 years. Some of the birds died in captivity, and Mr Ortiz-Catedral says it is hoped the results of post-mortems will reveal the cause, which could have been due to poor health or old age making those particular birds more vulnerable to the stress of the translocation process.